I started hearing about Flower Child from friends and acquaintances. My first thought was, it’s such a pretty name. “Flower Child” harkens back to the days of hippie freedom, organic living, love for Mother Earth, and so on. It is a fitting name for this restaurant, I think, because the food has a youthful flair to it. It is piquant and playful, full of flavor and texture contrasts… Definitely more hip than hippy, I think. I sent a note to the restaurant asking if I could come in for a chef’s tasting. I got a prompt response: an invitation to lunch. It was a cool spring morning in March when I showed up at Flower Child, Sandy Springs. 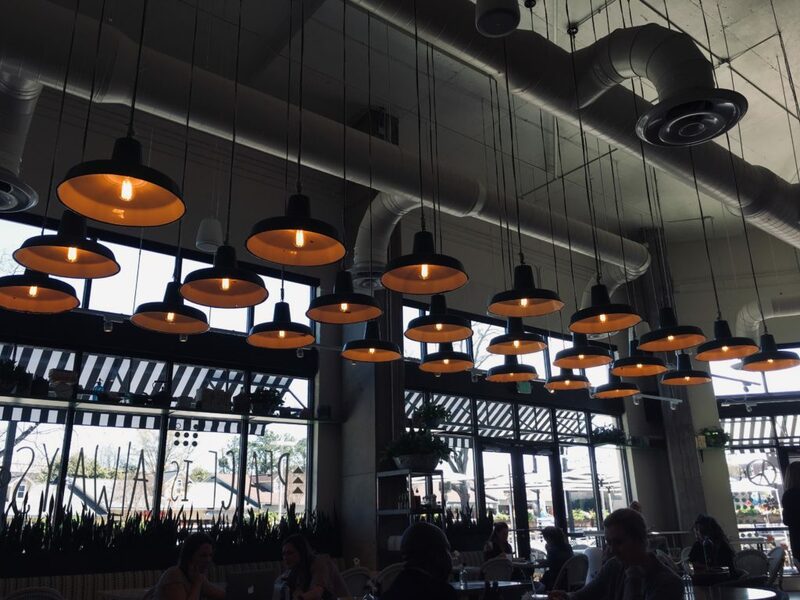 I instantly fell in love with the high, airy interiors, tall industrial lamp fixtures, houseplants and knickknacks decorating the windows, casual seating, cheerful waitstaff. I introduced myself to the girl at the counter. She went and spoke with the manager Mark who came over right away and welcomed me. 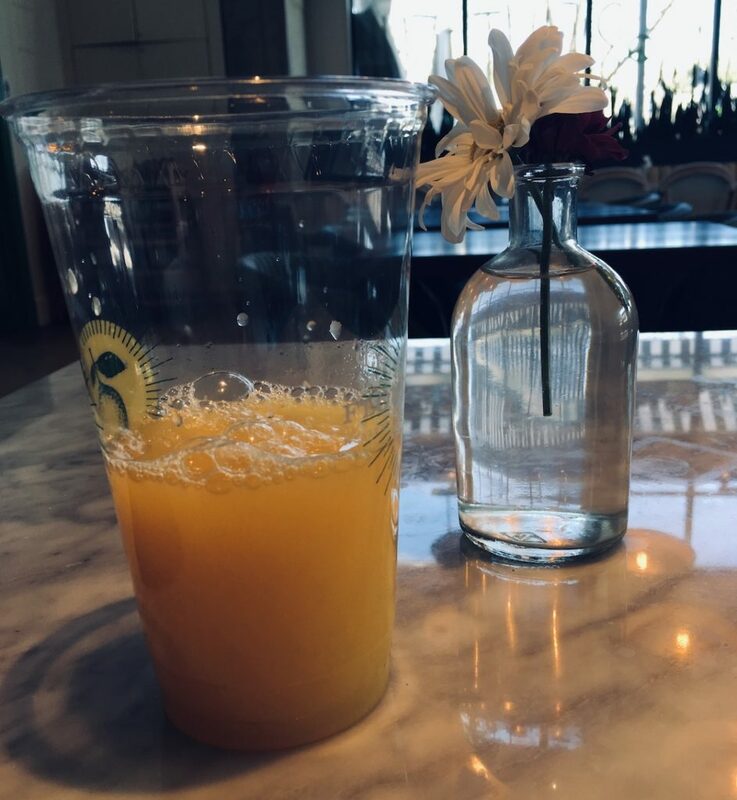 I skimmed through the menu and ordered a mango-pineapple fresh juice (no sugar added), a small plate of Grilled Asparagus, and the Glow Bowl. I am not one for consuming liquids with meals (save warm herbal tea, sometimes) but I was unable to resist this fresh juice combination of two of my favorite fruits, yum. The juice was tangy and delicious. 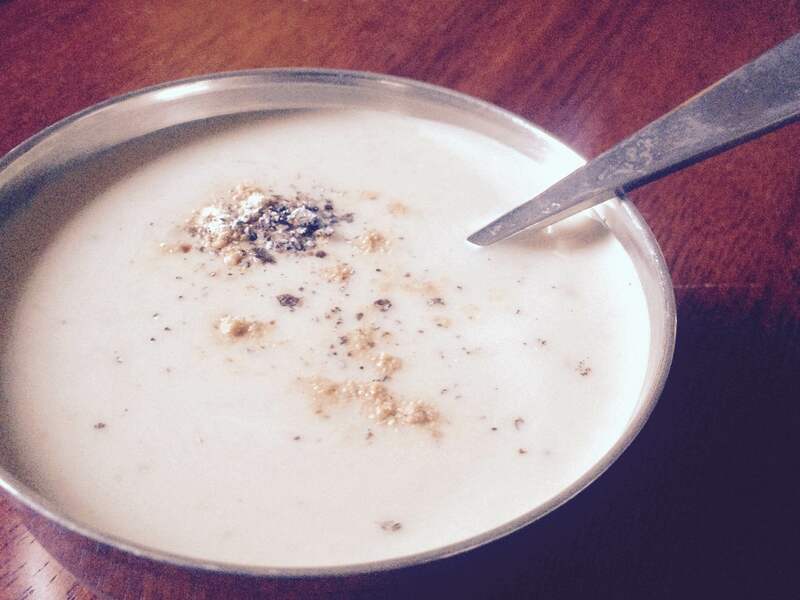 What it lacked for in sugary sweetness, it made up with freshness and flavor. I loved the juice but I was sorely disappointed to see that the glass was made from thin plastic (Grade 1, non-recyclable). I wish they’d used a glass tumbler instead. It would have been simple, elegant, eco-friendly, and sustainable. The food arrived quick. The asparagus spears were crunchy and delicious, grill marks included. It was served with farro, barley and red quinoa, flavored with ginger miso. 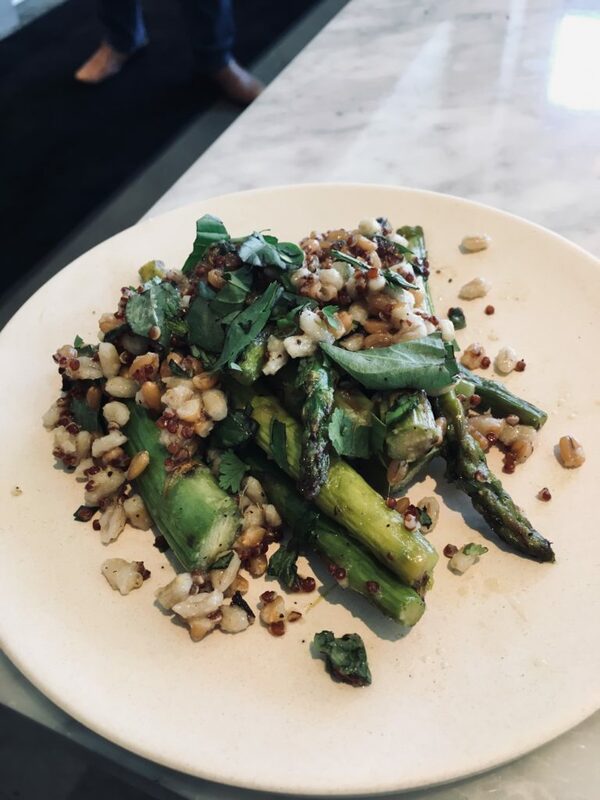 The dish had a gentle heat, and I enjoyed the combination of crisp asparagus and chewy ancient grains. 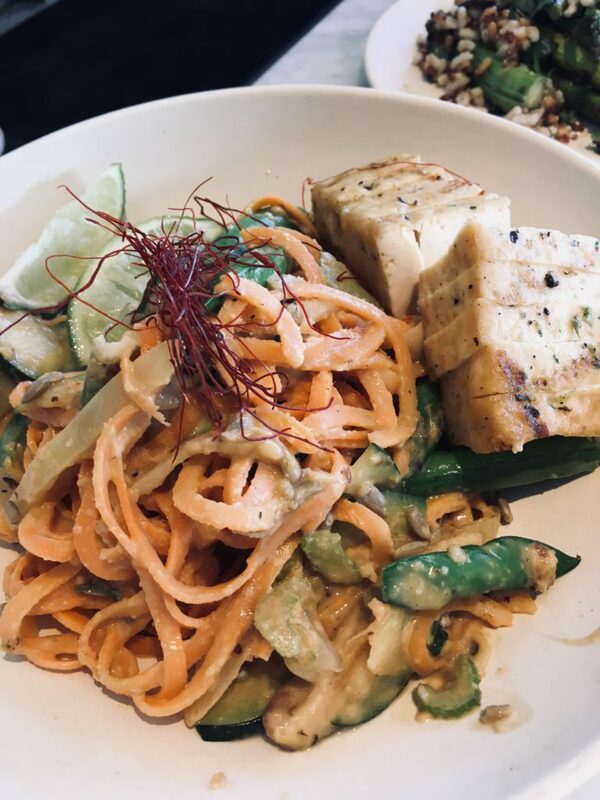 In contrast, the Glow Bowl was a delicious Pad Thai-style preparation of sweet potato noodles in coconut milk, sunflower butter, bok choy, zucchini, onion, and shiitake mushrooms, spiced with jalapeños. It was comforting and delicious, and I marveled at the light texture of the sweet potato noodles. Worth replicating at home, I think! 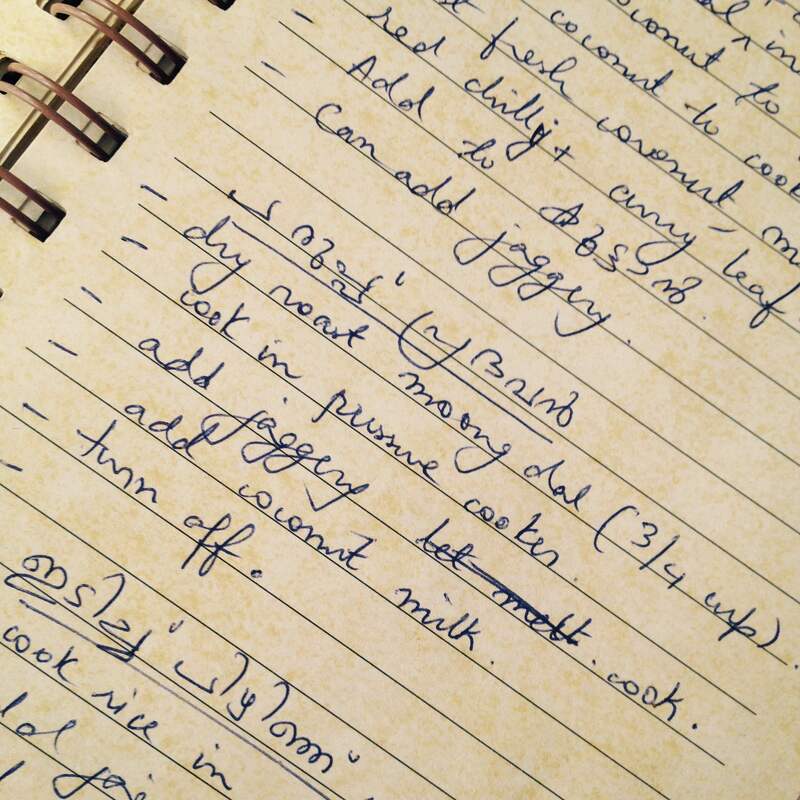 I alternated between one dish and the other, taking a good long time to chew thoroughly and savor the flavors. Mark came over to ask if I was enjoying the food. I could only nod, mouth full, happy smile on face. 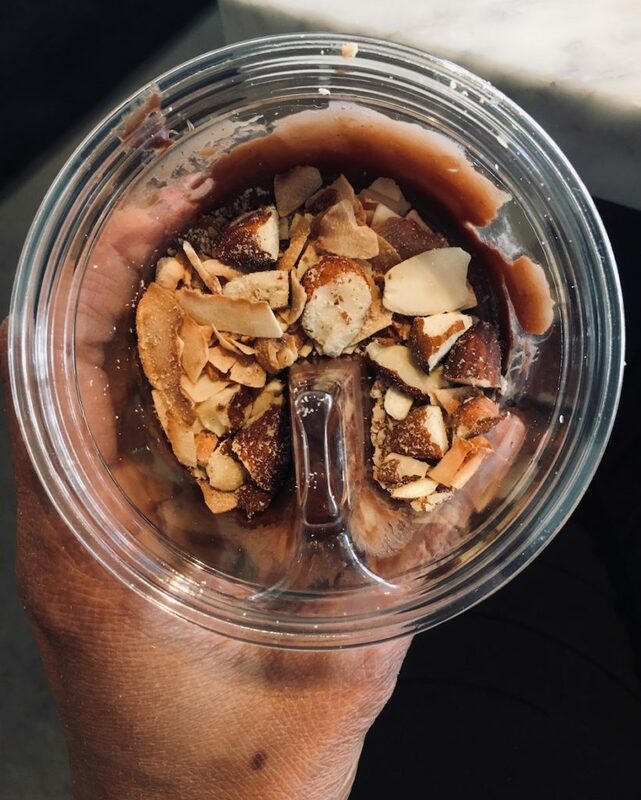 He mentioned that they served a vegan, gluten-free chocolate pudding made from coconut cream, cocoa powder and dark chocolate, flavored with vanilla paste, served with shaved coconut and sprouted almonds. How could I say no to that? The pudding was smooth and creamy, lightly sweetened, and absolutely delicious. I was sorely tempted to eat it all but I decided to be a good spouse who shared freely with her partner. I ate a little, and saved the rest to take home to my husband. (He loved it, although he wished it was less sweet). Alas, this pudding also came in a plastic, non-recyclable container, sigh. I loved visiting Flower Child and eating there. I found the food light and playful, delicious, and full of flavor. I adored the cheerful, sun-lit space, large windows, and the wood-marble seating. I’d love to see if/how their menu changes seasonally, and if they will incorporate local ingredients and recipes into their menu. Wondering when I can make another trip!